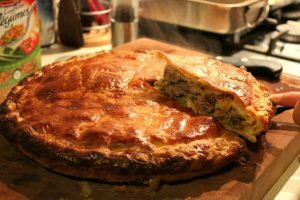 Home » Blog » Croustade de Canard – Thats Duck Pie to You and Me! I popped into my local mini supermarket the other day and just happened to look at their free recipe cards whilst waiting to pay. I was immediately struck by how amazing they were – utterly French and very high end if you know what I mean! I was especially drawn to the recipe for Croustade de Canard aux Epices. Reading the ingredients which include cinnamon, ginger, cumin, dried figs and coriander, I was intrigued and determined to make it. I am always on the look out for new, interesting ways to use duck. We live right smack in the middle of ‘duckland’ here in the Gers. When we have guests visiting from the Uk, I think it’s always nice to offer them some duck as it is synonymous with French country living. You can’t go wrong with a breast or a confit for sure, but a duck pie….well that really got me excited! It turned out to be very simple to make; I used ready made puff pastry which certainly helped and why not when it’s such a great product! The recipe says it should feed 4 but I think it could go further as it’s quite filling. Economical too as it only uses one duck breast bulked up with some minced pork. It was surprisingly moist as well. 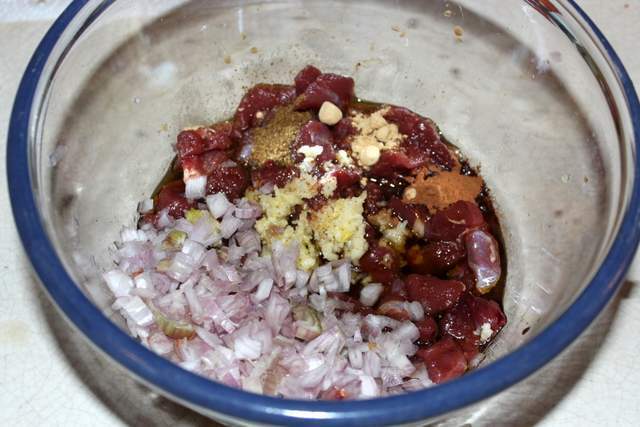 The chopped duck breast meat is marinated first in soy sauce and a little olive oil. And then some breadcrumbs soaked in milk are also added, all resulting in a lovely juicy pie filling. I had been concerned that it might cry out for a little sauce or gravy but in fact, it didn’t need it. 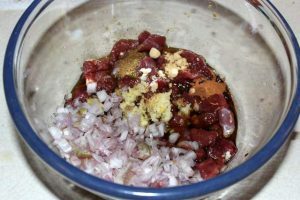 The spices and dried figs added a wonderful sweetness and warmth that works so perfectly with duck. I served it simply with some roasted vegetables and it made a delicious and unusual supper that I will most certainly be making again! We had pie left over too which was fabulous cold and would make a great addition to any Summer picnic. Remove the fat from the duck breast and chop the meat into little pieces. Marinade the duck in a bowl with the soy sauce, spices, garlic, chopped shallots and olive oil. Cover and leave in the fridge for at least 30 minutes. Meanwhile, blitz your bread into breadcrumbs and put in a bowl with the milk and leave to soak. Pre-heat your oven to 200C. 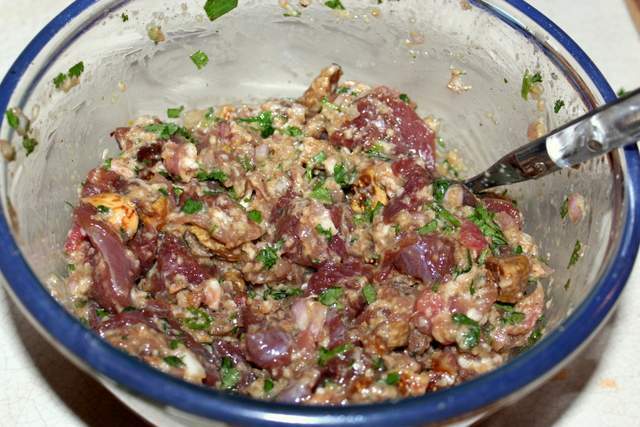 In a large bowl, add your minced pork to the marinaded duck meat. Add the cut figs, 1 egg, the chopped coriander and the soaked breadcrumbs. Season well and mix it all up. Take a large oven tray and on top of some baking paper, lay one of your sheets of puff pastry. In france they come already round but if yours are rectangular, worry not, just make a rectangular pie! Pour over the duck & pork mix and spread out evenly leaving a 2 cm border all the way round the edge of the pastry. 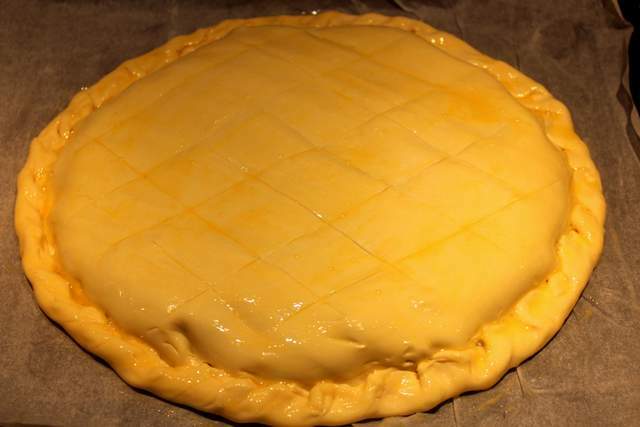 Use the second piece of pastry to cover the pie and just fold over the edges all the way round to seal the filling in. 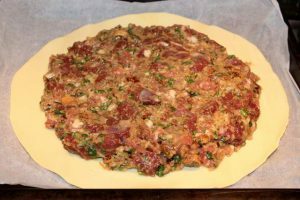 It doesn’t have to be too neat as it will meld together and look pretty when it’s cooked. Gently score a criss cross pattern on the top of the pie if you like. Then beat another egg and brush it all over the top of the pie and over the edges. Bake in the oven for 45 minutes. I am entering this dish into two blog challenges. 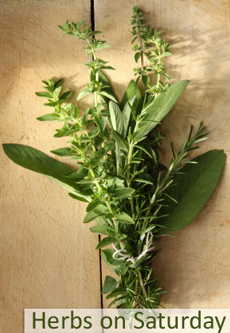 Firstly, Herbs on a Saturday created by the lovely Karen over on Lavender & Lovage. 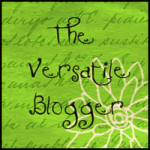 Please do check out her blog, It’s really rather good! This months challenge is being hosted by Vanesther over on Bangers & Mash. 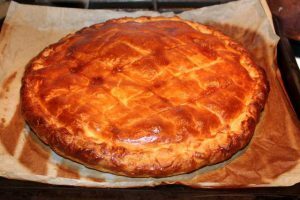 And for the first time I am entering into Alphabakes – the January challenge is to bake something with the letter ‘D’ so I think my Duck Pie fits the bill! This is co-hosted by Caroline from Caroline Makes and Ros from The More Than Occasional Baker. 14 Comments on "Croustade de Canard – Thats Duck Pie to You and Me!" This sounds and looks incredible. I’m a big fan of duck but we don’t eat it all that often as it’s not the cheapest, but this recipe looks pretty economical using just the one duck breast. I can’t wait to try it out on my family! And a perfect entry too for this month’s Herb’s on Saturday. Thanks so much for entering. I just wanted to tell you that we made your Duck Breast with Roast Chestnuts for our Christmas Eve meal this year and it was absolutely stunning to look at and delicious to eat. A sure winner for a special meal. Thanks for including it on your blog. Keep up the good work!!!! Like you I’m quite surprised you’d find such a recipe in these parts and assumed most of the locals would eat relatively simple fair! It sounds like a really interesting and unusual combination that beckons to be baked. Do you reckon it would be too sloppy if I used frozen fresh figs, still have way too many in the freezer and always looking for ways to use them up. This looks delicious, I would never have thought to put duck in a pie. Thanks for entering Alphabakes! Thanks Caroline! Glad you like it. Duck works so well in the pie, unusual and delicious! I’d never heard of this (despite living in the heart of the duck region!). It sounds absolutely divine – quite rich though? I wonder if I could make it with a wheat-free pastry? It is yummy. Like any pie, it is fairly rich but not overly so. It is moist and unusual! If you make it with wheat free pastry, let me know how it goes. This sounds delicious! I cooked duck for the first time last month when I made rillettes from duck legs and was surprised that it wasn’t too expensive to make as I’d always assumed duck would be out of my price range. Thanks for this great recipe, I’m definitely going to try it out as soon as I can. Just flicking through your recipes. This pie is catching my eye. I’m loving all of your creations. Wow thanks David, glad you like the look of it. It doesn’t disappoint…!